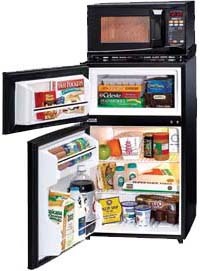 MicroFridge© with Safe Plug™ is the original combination appliance, designed for the collegiate environment. Hundreds of thousands of students nationwide have enjoyed the convenience of a MicroFridge© with Safe Plug™ in their rooms. Now, you can enjoy even more convenience with our on-line ordering system! MicroFridge© with Safe Plug™ is approved by your school because it’s safe. There are no exposed heating elements and MicroFridge© with Safe Plug™ patented internal circuitry is designed to reduce energy consumption. PLUS, we provide FREE pick up and delivery to your campus. Why not order a MicroFridge© with Safe Plug™ for your room today! Be sure to check out our MicroFridge© with Safe Plug™ Quick How-to Guide (PDF document 175KB) on setting up your unit, as well as safety issues to be aware of.